I’ve been feeling so rough, with such bad cramps, I haven’t even tried to do anything much. So, plenty of knitting time. Or in this case crochet. The pattern is by Catherine, available in Inside Crochet magazine, issue 9. It only took me a few hours last night and an hour or so this morning to make it start to finish. I used Cascade 220 yarn. 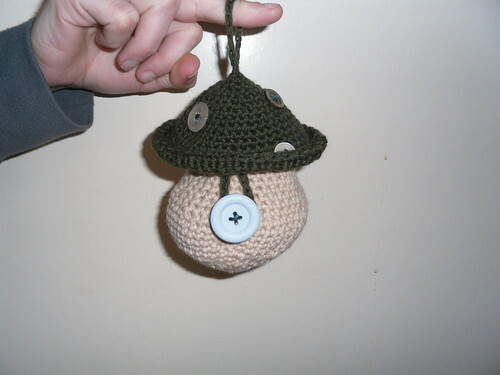 The mushroom is a birthday present for my Mum, who loves mushrooms and toadstools. I’ll probably buy a few handkerchiefs to put in it, but she can use it for whatever she wants. This entry was posted on August 15, 2010 at 10:14 pm and is filed under Craft, Mum. You can follow any responses to this entry through the RSS 2.0 feed. You can leave a response, or trackback from your own site.